When it comes to grilling, some vegetables are better than others. Zucchini? Yes! Portobello mushrooms? Of course! Greens? Yup, even greens! 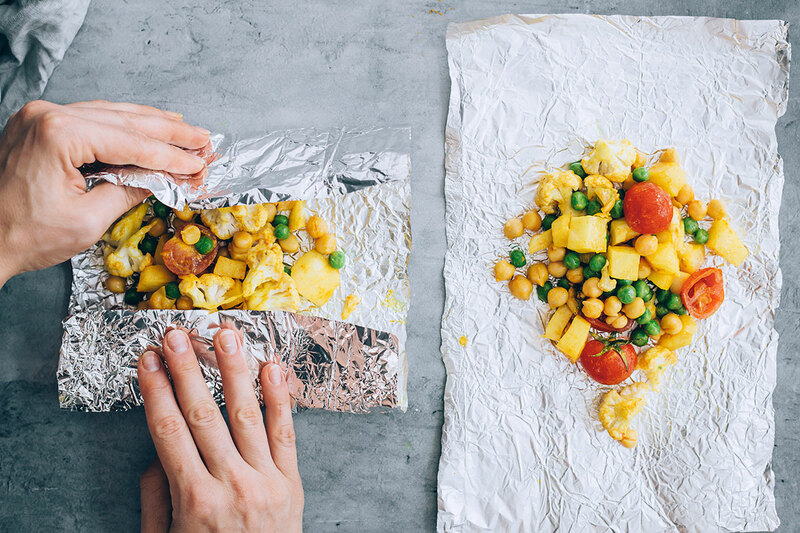 Other veggies just aren’t as conducive to the grill, but in those cases, foil packets are the great equalizer. Or something like that. 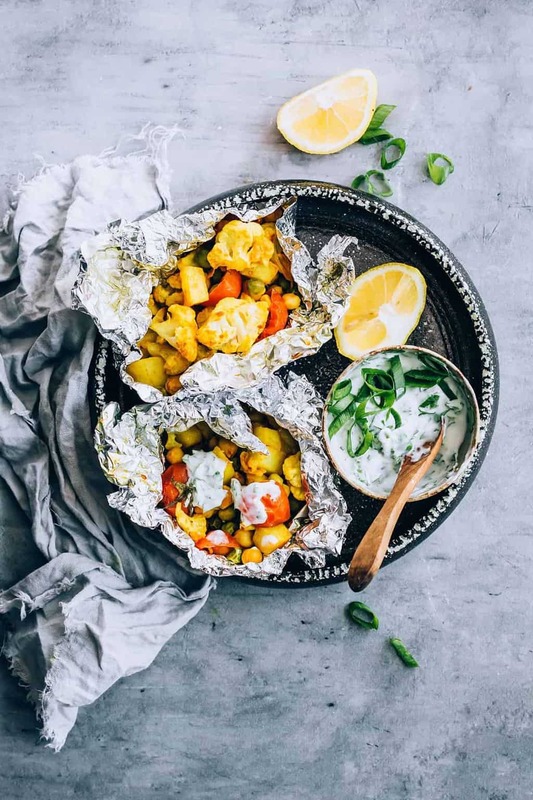 If you haven’t made them before, it’s simple: just put an assortment of vegetables and seasonings on a sheet of foil, fold it up, and pop the packets on the grill. It’s the perfect method for grilling anything that would fall between the grill grates, that’s too small for a skewer, or that needs a little steam to tenderize, like cauliflower. The other thing that makes packets great is that if you’re attending a barbecue where there’s meat on the grill, you don’t have to worry about little bits and drippings getting on your vegetables. (That grosses me out!) And if you’re planning a camping trip this summer? You can totally do veggie packets on the campfire too! This recipe is from Jackie Sobon’s Vegan Yack Attack On the Go: Plant-Based Recipes for Your Fast-Paced Vegan Lifestyle. Jackie’s blog is one of my faves, so naturally I am digging her latest cookbook too–and I totally appreciate that all the recipes are either make-ahead, quick and easy, or portable. Sometimes all three! We’re sharing Jackie’s recipe for Blueberry Zucchini Breakfast Cookies on Hello Glow today. Some of my other must-make recipes from the book include the Teriyaki Mushroom Jerky, Sheet Pan Squash Tacos, and Beer Can Pulled Cabbage. 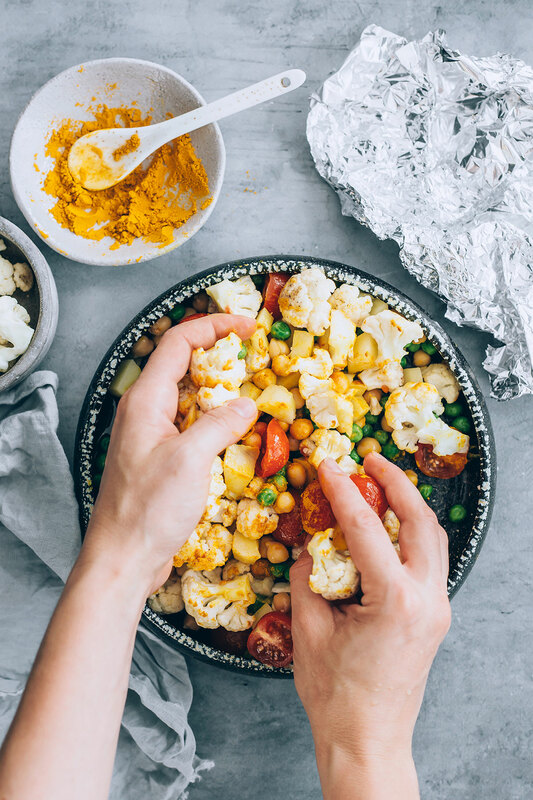 There are recipes for breakfast, snacks, lunches, dinners, desserts, and everything in between–and they’re all recipes that rely heavily on natural, whole-food ingredients. This is a book that belongs in every plant-based kitchen. Reprinted with permission from Vegan Yack Attack On the Go by Jackie Sobon. Preheat the grill to roughly 400ºF (204ºC). 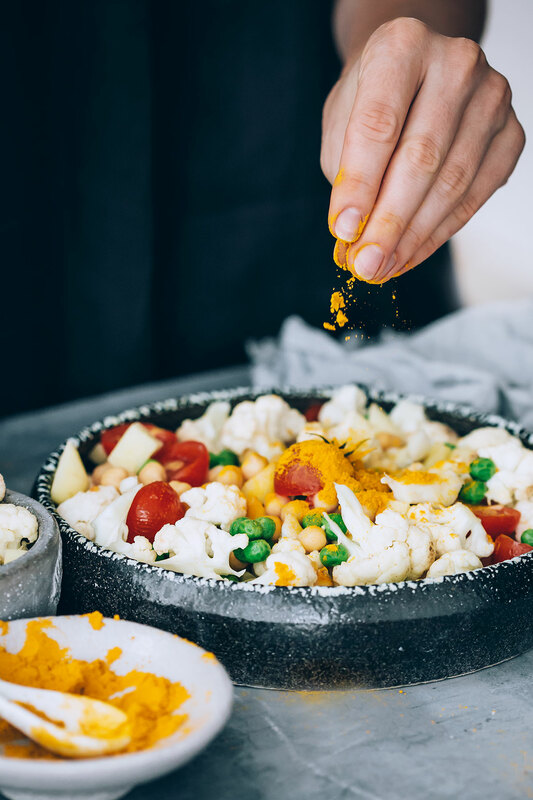 In a very large mixing bowl, place the cauliflower, potatoes, white onions, tomatoes, peas, and chickpeas. Drizzle coconut oil over the top of the veggies, and stir until coated. Add the curry powder and a pinch of salt and pepper, and stir again until evenly coated. Place each packet on the grill and cook for 7 minutes, flip them over and grill for an additional 7 minutes. Carefully, open one packet slightly, and poke the cauliflower and potatoes to see if they are tender. If not, cook until they are. Once cooked through, place the packets on a cooling rack for 5 minutes before opening and serving. When the packets are opened, squeeze lemon juice over each one, and top with salt and pepper. Serve packets alongside yogurt sauce and enjoy. Tip: Try preparing these the night before you go to a cookout or picnic, so that the flavors really get to marinate, and you won't have to worry about it the day of! Note: For higher protein content, substitute the chickpeas with 14 ounces (400 g) extra-firm tofu, diced.